Adam (Alec Baldwin) and Barbara (Geena Davis) are a young, happily married couple living in a spooky house out in a small town. Nothing could possibly go wrong. Then they die. When they return home (at first unaware that they’re dead) they discover quite a bit of time has passed since their deaths, and a new family of weirdos have moved into their home. Lydia (Winona Ryder) is a teenage goth who wants little to do with her step mother Delia’s (Catherine O’Hara) nutty artistic redesigns or her father Charles’ (Jeffrey Jones) scheme to turn their small town into the next big real estate boom. Lydia soon meets Adam and Barbara, whom only she is capable of seeing, and the pair of ghosts want her family *out*. Well, seemingly there to help them in their endeavor is the professional “bio-exorcist”, Betelgeuse…otherwise known as “Beetlejuice” (Michael Keaton). All they have to do is say his time three times and he’ll use his paranormal powers to evict Lydia’s family from the home (as violently as possible). Adam and Barbara’s caseworker from the Neitherworld recommends they steer clear of Beetlejuice, as he is not to be trusted. Tim Burton has a way of making the grotesque and the macabre look like as much fun as possible. Movies like Beetlejuice, the Nightmare Before Christmas and the Corpse Bride are proof of that. The Neitherworld is packed with corpses; people who have been severed in two, had their heads shrunken by voodoo priests, choked on chicken bones or died in grisley car wrecks. All these mutilated dead people are brought to life with a visual style that treads that thin boundary between “gruesome horror movie” and “humorous cartoon”. Sometimes, you don’t know whether to laugh or wince. The act of dying is treated in the most mundane, ordinary way as possible. The dead are given a manual, a caseworker and can even spend a great deal of time in a limbo that just happens to look extremely like the waiting room at a doctor’s office. These “rules” and “procedures” seem so well thought-out and logical that one would almost expect death to happen this way. The guidelines presented in the film which rationalize the strangeness of hauntings are some of the most fun, particularly the explanation as to why the dead can’t leave the homes they haunt (otherwise they become food for hungry Sandworms). The title villain, whom you love to hate, is characterized hilariously by Michael Keaton. He brings this manic, cartoon character-like quality to Beetlejuice, yet at the same time, a very violent and angry side as well. Everything is a big joke to him, whether it’s playing charades with Lydia or trying to kill her parents by turning into a giant monstrous snake. He’s a great villain because he doesn’t really have any alterior motives or secret agendas…he just likes messing with people. The stop motion special effects for creatures like the Sandworms look like they jumped straight out of the Nightmare Before Christmas, which is a definite compliment. The rest of the bizarre monsters from the Nietherworld are realized through elaborate costumes: some humorous and some just plain scary. Beetlejuice is a very fun horror comedy, which aside from a few naughty moments, is perfect for most of the family, especially if one of your kids likes scary things. Seriously though, Beetlejuice is a fine example of Tim Burton’s visual sense, mixed with great writing and excellent character acting. Next to Michael Keaton’s performance, I think the lovely Winona Rider should also be mentioned for her outstanding work. As Lydia, she gives a lot more depth to a character who could have easily been another shallow ‘goth girl’. 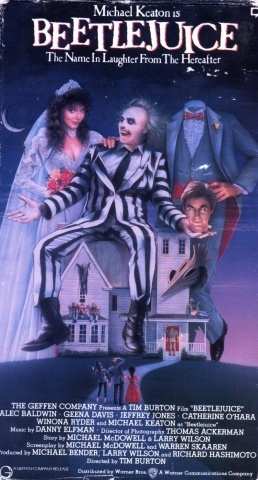 Overall, Beetlejuice is one of my favorite movies!